Shaklee Independent Distributors since 1964: Gayle, Summer, & Amanda Spinks. (In Loving Memory of Founders Bob & Pat Ewing) Holistic Wellness/Fitness and Nutrition Coaches in Southern California. Check out these helpful nuggets from We Asked KonMari Consultants for Their Best Decluttering Tips before you start your Spring Cleaning and of course, make sure you have your Shaklee Get Clean Starter Kit ready to rock n’ roll too! Continue reading It’s That Deep Cleaning N’ Decluttering Time Of Year! Welcome New Customers! Neil Fabula Congrats Customer Loyalty Rewards Earners! * Rosalind Doak, Joyce Bohannon, Kathy Madraso, Sharon Warschauer, Janet Mason, Charles Duvall, Mary Nungary, Roma Wagoner, Mary Maury, Patricia Jones (Every month, order $100+, automatically receive $15 credit on … Continue reading RLEI April 2019 ROLL CALL! 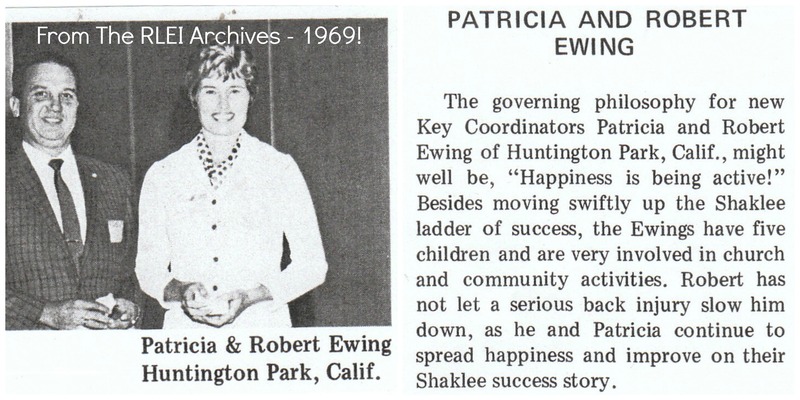 Check out… PAT & PATRICIA MORRISON: EXECUTIVE COORDINATORS in Medford, Oregon “Pat Morrison’s Shaklee journey began 47 years ago when she was a young mother who had tried ‘everything’ to regain her energy and health (including supplements). She was at … Continue reading RLEI Organization Recap for February 2019! Welcome New Customers! Virginia Gravely, Ann Edwards Congrats Customer Loyalty Rewards Earners! * Cheryl White, Mead Kirkpatrick, Rosalind Doak, Sharon Warschauer, Judith Huffman, Nancy Raney, Nancy Neville, Sandra Ohlman, Ron Walker, Ann Dewitt, Beverly Savage, Roma Wagoner, Leslie Beach, Kay Rando, … Continue reading RLEI March 2019 ROLL CALL! Check out… Lloyd and Kathy Moritz have fully taken advantage of the Shaklee cross-border business opportunity. They originally became Business Leaders in Canada, and were easily able to transfer their business to the United States, when they immigrated here in … Continue reading RLEI Organization Recap for January 2019!